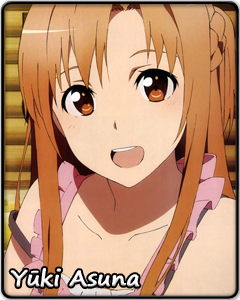 Yūki Asuna was an ordinary fifteen-year-old girl with her own friends, life, and dreams. If there was anything that made her special, it was that she had no intention of giving up on those things, even if the forces trying to take them away were far beyond her. When trapped in the digital world of a homicidal madman, Asuna needs little time to overcome the initial shock and set her mind to work on getting out of the virtual prison. One wrong move could cost Asuna her life, but she allows herself no hesitation. To her, every day spent living a lie is like a small death in itself. In order to keep moving forward, Asuna is ready to kill all fear, doubt, and weakness in her heart. And she expects nothing less from those who choose to walk be her side. As days pass and turn into months, however, Asuna begins to notice that not everything around her is a lie. The people she meets, the experiences she has, and even the feelings she discovers, all of them can be invaluable even if the world around her is not real. If Asuna can accept those things and learn more about herself, her time of struggle will not have been in vain.